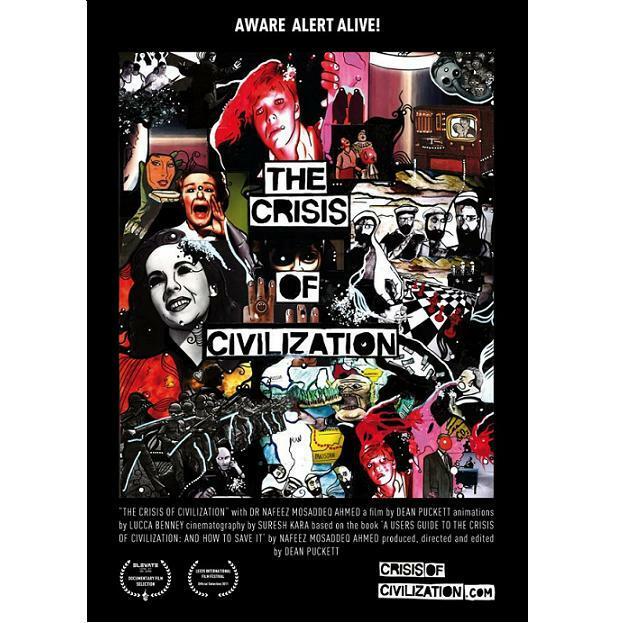 The Crisis of Civilization, due to premiere tomorrow, is a documentary film that is remarkably pleasant to watch considering its subject matter: the looming destruction of civilisation as we know it. Hicham Yezza reviews. The Crisis of Civilization, due to premiere tomorrow, is a documentary film that is remarkably pleasant to watch considering its subject matter: the looming destruction of civilisation as we know it. Over less than 80 minutes of running time, Dr Nafeez Mosaddeq Ahmed, the principal narrator of the film – and author of A User’s Guide to the Crisis of Civilization: And How to Save It – draws a compelling portrait of the emerging economical, political and environmental trends that are likely to shape our common future over the next few decades. His thesis is devastating in its simplicity: unless structural changes are introduced to the way we run our world, we won’t make it past this century, possibly not even the halfway mark. This might not strike readers as particularly different from mainstream environmental orthodoxy. However, CoS adopts a bold set of starting premises. First, only by observing the trends as a whole, Ahmed argues, can we really get a sense of the sheer urgency of the situation. Whereas anthropomorphic climate change is in itself a very serious threat, the true extent of the unfolding horror can only be apprehended if you combine it with, for instance, the arrival of Peak Oil. As Ahmed explains, although most players in the global oil market continue to dismiss fears that the age of cheap oil has reached its “peak” period, the evidence emerging from those very companies’ reports is very disturbing: BP’s own internal figures indicate that oil production, which had been increasing every year until 2004, plateaued all the way to 2008 before decreasing in 2009, for the first time ever. The end of cheap oil means the rise of more expensive, harder to extract alternatives, including tar sands, possibly the most environmentally destructive energy resource today, with grave consequences for the climate and the global ecology. The film also touches on a number of core themes: Peak Food, Economic Instability, International Militarization and International Terrorism. There’s plenty of food for thought here, for convert and sceptic alike. Surprising facts abound, as well as more standard ones, all threaded together into one encompassing and passionately-argued narrative. I found the film’s aesthetic delightful, the result of film-maker Dean Puckett (The Elephant In The Room) and animator Lucca Benney’s artful concoction of clips from 40s commercials, B-movies, quirky animation, and more familiar images of Bush, Bin Laden and Brzezinski. The Crisis of Civilization packs a lot in, and delivers it in a tidy, understated manner, which is certainly a good thing considering it is mostly about how we’re all (almost) doomed. However, as Ahmed points out mid-way through the film, those who think this is mere alarmism ought to realise we have much to be alarmed about. From the way the banks have created and sustained a housing bubble to the gutting out of democratic structures by corporate interests, too much has happened for us to pretend things will continue like this forever. Having said that, a thread of optimism runs through the film, “another world is possible” a persistent motto. This film is necessary viewing, not just for activists but for anyone who’s planning to hang around this planet for the foreseeable future. Yes, I’m looking at you. Anthropogenic. Not anthropomorphic. Unless you want to say climate change has big ears and big eyes and speaks in a funny voice. Thank you Michael. I was obviously too distressed by impending intergalactic doom to pay attention…. i am verry happy today because i found your magazine !!!! thank you ! !